Absolutely perfect villa to stay in an oasis of relaxation. Independent, spacious, elegant villa, just renovated. It consists of 3 well-appointed bedrooms, 2 complete bathrooms. It is possible to stay up to 8 people thanks to the presence of a comfortable sofa bed. Externally there are 500 square meters of green garden, 3 stores, 3 outdoor living areas furnished and comfortable, outdoor and indoor shower, evening lighting, parking, ceiling fans in the bedrooms, 4 bicycles available to guests. The kitchen is complete with all necessary crockery and utensils. It is located in the center of Castellaneta Marina, an 8 minute walk from the sea and 5 minutes walk to the main bars, restaurants, shops. It is perfect for a relaxing stay immersed in nature among the pinewood scents and the waves of the sea. From Castellaneta Marina it's easy to reach other wonderful destinations in Apulia like Cisternino, Alberobello, Martina Franca (VALLE D'ITRIA) and Salento. There is also a cot available for children. We would be delighted to welcome you to this unforgettable location. CHARMING, SPACIOUS and FREESTANDING VILLA WITH 3 BEDROOMS (8 BED SPOTS), 2 BATHROOMS. 4 BYCYCLES AVAILABLE FOR THE HOSTS. 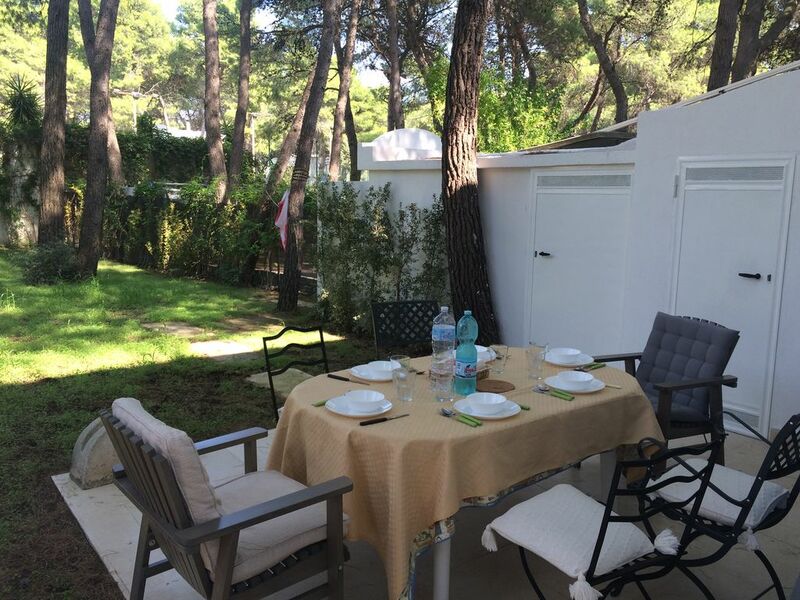 THE VILLA IS PERFECTLY LOCATED IN THE CASTELLANETA MARINA DOWNTOWN AREA: 8 WALKING MIN FROM THE BEACH AND 5 WALKING MIN FORM THE SHOPPING AREA WHERE ALSO RESTAURANTS, CAFES, PUBS ARE. IT IS EASY TO GO FROM CASTELLANETA MARINA TO ALL THE WONDERFUL DESTINATIONS IN PUGLIA LIKE CISTERNINO, ALBEROBELLO, MARTINA FRANCA AND SALENTO'S REAGION. ALL OF THE COOKING EQUIPMENT AVAILABLE IN THE KITCHEN (MOKA, COFFEE, TEA, TOASTER AND PUGLIESE EVO). FIRST AID KIT IS ALSO AVAILABLE. AT BABY'S CRADLE IS EVENTUALLY AVAILABLE. WE WOULD BE HAPPY TO HAVE YOU IN THIS AMAZIN PLACE. There are 2 large bathrooms, both with WC, bidet, sink and cabinet. In addition, the bathroom upstairs is also equipped with SHOWER BOX. There is also an outdoor shower that can be used in complete privacy. Castellaneta Marina is a quiet seaside resort overlooking the Jonica Pugliese coastline. For many connoisseurs of the area it is chosen as a privileged destination for spending the summer holidays under the banner of relaxation and contact with nature. In fact it is a small village surrounded entirely by the pine forest giving the place a distinctive scent of wood and pine trees. In recent years it has become a destination chosen by many foreign tourists, certainly because the place is strategically connected with the now international beauties of VALLE D'ITRA and the beaches of SALENTO but still preserves the ancient simplicity and quiet that other Apulian localities have unfortunately lost. - Water sports in Castellaneta M.
- golf courses, tennis, football at Castellaneta M.
In addition, the villa is only 300 meters from the center and therefore bars, pubs, shops, restaurants are easily reached on foot in a few minutes and also the location allows residents not to be bothered by passing cars or other noises. I recommend staying in Castellaneta for couples, families, groups of friends looking for true regeneration, physical and mental. Do not underestimate the less requested months as these have to offer a magic and a quiet to be discovered.